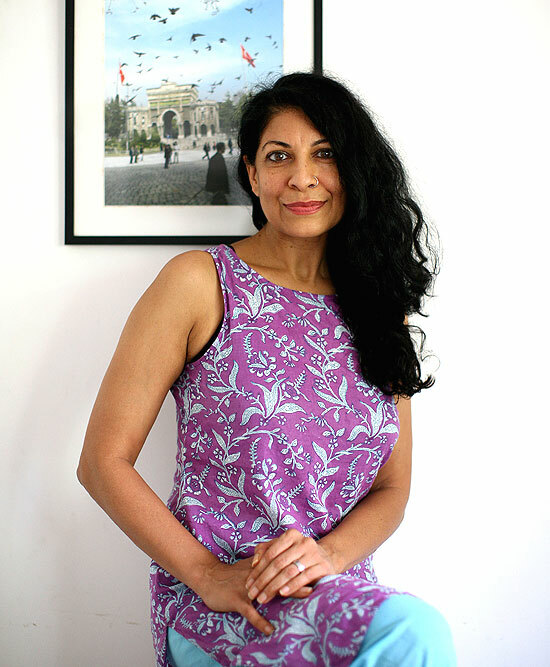 There’s a chilling scene in Canadian filmmaker Nisha Pahuja’s documentary The World Before Her. 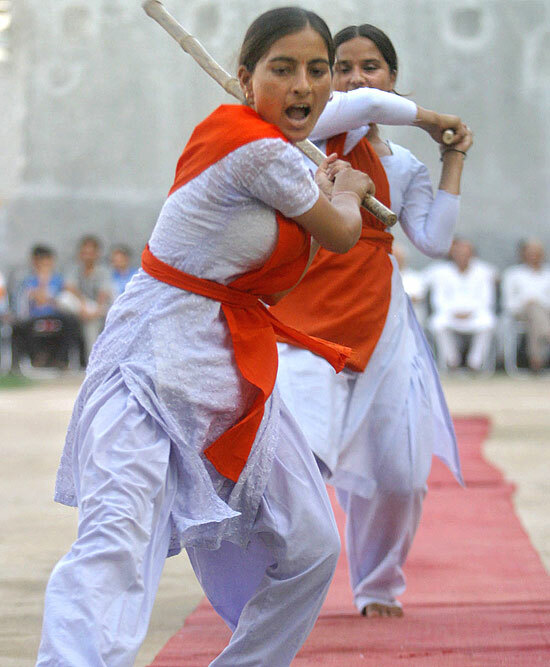 Prachi Trivedi, a brawny, bushy-browed counseller with Durga Vahini, the women’s wing of the hardline Vishwa Hindu Parishad (VHP), talks about being beaten with a hot iron rod by her father. There is a fiery rebellion in her eyes, yet, eerily, a gratefulness. “Knowing I’m a girl child, he let me live,” she says. “In a traditional family, people don’t let a girl child live....” Juxtaposed against her story is that of Pooja Chopra, winner of the 2009 Miss India pageant. Pooja’s mother left her father when he said he didn’t want another daughter. Pahuja’s film alternates between polar opposites: the ‘aspirational’ world of beauty pagea­nts and that of the Durga Vahini. Two dubious means of empowering women. Following are excerpts from the screenplay, focusing on the Durga Vahini portion, a glimpse into the brainwashing and mass hypnosis young women undergo at its camps. Exterior. Building. The lights turn on. 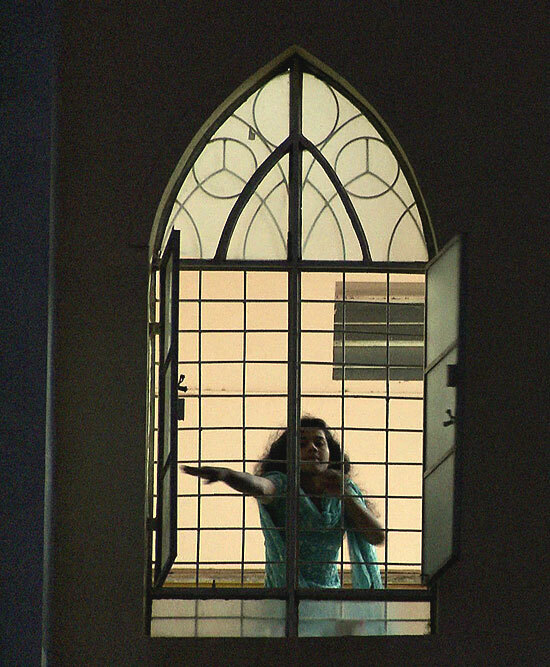 A woman opens a window. 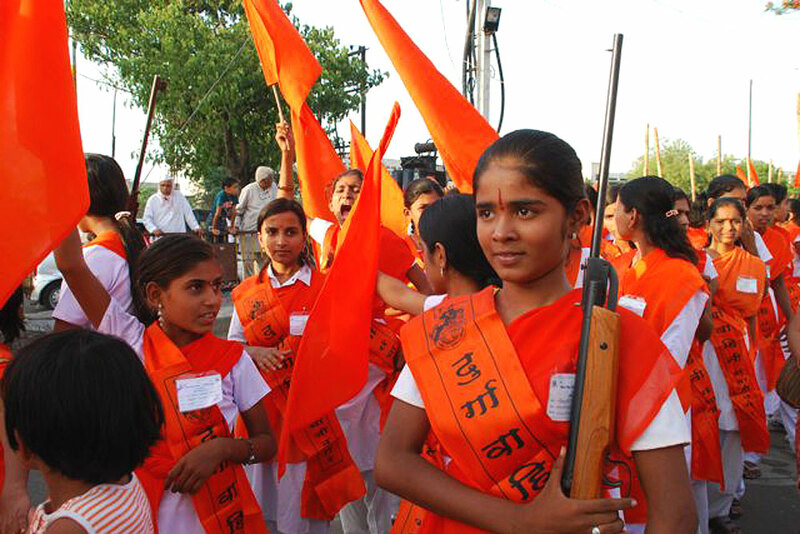 Super: Every year thousands of girls attend camps run by Durga Vahini, the women’s wing of the largest Hindu nationalist group. Super: Over the past 20 years, Hindu nationalism has become a pervasive cultural and political force in India. Super: This is the first time a film crew has been allowed in a camp. A woman speaks to the girls. Durga Vahini camp—Prachi instructs the girls at the camp. 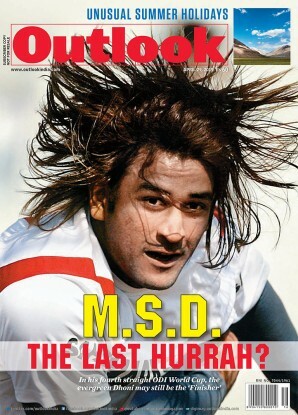 Prachi Trivedi (in Hindi): Hurry up, I’m not going to repeat myself. Move this way. You, move back. When I tell you to move back, it means to get in line with me. Move forward. Prachi (Hindi): I don’t like girlish type girls. Speaking all nonsense. Even if she’s not physically strong, she should be mentally mature. And there are some girls here I feel like slapping them...banging them out from here, but this is not my camp, so I don’t have the authority. Prachi (Hindi): Quarter turn right. You should be facing this way.... Why are you looking behind? Look ahead. Interview. Yogita, counsellor at a Durga Vahini camp. Yogita (Hindi): They live at home, they’re not used to discipline. So you have to shout and get angry. Nobody can say, “I’m not in the mood so I won’t do it.” You have to do it. If every person is disciplined, then society will become disciplined as well. Durga Vahini camp­—Malaben Rawal speaks to the girls. Malaben Rawal (Hindi): What’s the point of all this? Our girls don’t even know who they are anymore. What do girls think about? They think of actresses like Priyanka Chopra. You girls are from the villages, but there’s a different attitude in cities. Today Aishwarya Rai and Sushmita Sen wear skimpy clothes in front of the whole world, pose in front of the cameras, walk the catwalk, answer a few questions, bat their eyelashes and become Miss Worlds, endorsing foreign products, and millions of Indian girls buy these products. And who do they give their money to? Foreign corporations. Are you seeing the picture? And they talk of culture. Where has the self-respect of Indian women gone? We don’t know who we are any more. Remember, if there is a supreme religion in this world, it’s the Hindu religion. Malaben Rawal (Hindi): The girls we work with in Durga Vahini are 15-25 years old. We teach them about their religion, country and themselves. We try to open their eyes. It’s good for the country and it’s good for them. We start that process here. We teach them that the West has its own traditions and we have ours. Approx. 25 minutes into the film. Durga Vahini camp. Night. Exterior. Girls in uniform filing in a line. A man raises a saffron flag with Om on it. Shot of young girls taking a salute. 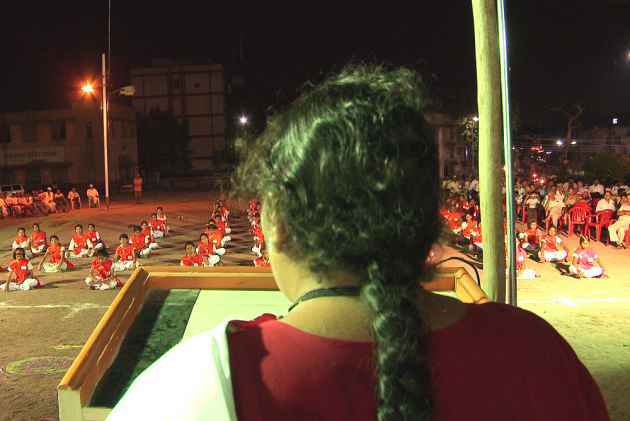 Aparna Ramteerthkar, social activist, addressing the camp (Marathi): Today...I must tell you your duties as women. Girls should be married by 18 because, by the time they’re 25, they’ll become so strong-willed you won’t be able to tame them. Cutaway of girls listening intently. Close-up of a girl blinking. Aparna (continues): My mother didn’t give me permission to go to school. She said, “If you can read and write, that’s enough.” One evening, I looked at myself in the mirror and got slapped. I still remember her slap. Over-the-shoulder shot of Aparna. Girls squatting on mats, listening. Aparna (continues): Today, girls are educated, but their heads are in the clouds. Is it really necessary for you to leave your homes, just for your ego, and go chasing a career? Is that really necessary? Have we become so westernised? Erase these thoughts from your minds. Cuts of close-ups of girls, wide, vacant eyes, furrowed brows. Aparna (continues): We keep talking about equality of the sexes. It’s even written in the Constitution, but think about this. Can you really hide your natural weakness or character as a woman? Five thousand years ago a woman’s character was important. And that hasn’t changed. Archival footage of women being beaten in public. Super: Hindu extremists are also called the ‘Indian Taliban’. They often accuse women of defiling Hindu culture. Women have been beaten for being seen with a man...or for going to a bar. In 2009, members of an extremist group attacked women for drinking alcohol. Two victims were hospitalised. Halfway through the film. Camp. Women receive defence training. Trainer, male: You can break the arm, the elbow, the knee or even someone’s neck. So a girl weighing 100 pounds can break the arm of a 250-pound man in seconds. Times are changing, you must be prepared to deal with these times. First twist the hand. Then take his arm under yours, then a slight jerk. He’ll move his arm in a second and if you give him a real jolt you’ll hear the sound of bones breaking. One, release the shoulder, two, yes, three, four. Interview with Hemanth Trivedi, Prachi’s father. Hemant Trivedi (Hindi): Prachi has attended these camps since she was three. Now she’s 24.... She’s probably attended about 42 camps.... Because of this, she’s totally mature, grown up and trained. Man: So one, cross block, here, cross blocking. With this hand. Two, twist the hand with the wrist locked. Interviewer: Would you kill for Hindutva? Prachi: Whoever goes against my religion. We’ll not go and try to kill anyone, but when they try to attack us, we are also not going to run away or hide. We are going to face them. And if needed, we have to kill. We won’t look here or there. We are going to kill them. Because that is not hinsa (violence)...that is self-defence, that’s what we are doing. Prachi’s father (Hindi): Nothing would make me more proud than my daughter giving up her life for Mother India. We would be extremely fortunate. There would be no one who would be more happy. But that’s in God’s hands. This generation is getting destroyed. Values are going down the drain. And where will we get our values? We can’t buy them at a bazaar or a mall. We get our values and culture from our parents. I’ve given her good values. If you plant a seed, then you expect a good crop.